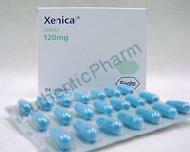 Xenical blocks some of the fat that you eat, keeping it from being absorbed by your body. Xenical is used together with a reduced-calorie diet and weight maintenance to treat obesity in people with certain risk factors (such as diabetes, high blood pressure, and high cholesterol or triglycerides). Xenical may also be used for purposes other than those listed in this medication guide. Get emergency medical help if you have any of these signs of an allergic reaction: hives; difficulty breathing; swelling of your face, lips, tongue, or throat. Stop taking Xenical and call your doctor at once if you have severe pain in your upper stomach spreading to your back, nausea and vomiting, and a fast heart rate. These could be signs of pancreatitis. The following side effects occur commonly with the use of Xenical. They are the natural effects of Xenical's fat-blocking action and are actually signs that the medication is working properly. These side effects are usually temporary and may lessen as you continue treatment with Xenical: * oily spotting in your undergarments; * oily or fatty stools; * orange or brown colored oil in your stool; * gas with discharge, an oily discharge; * loose stools, or an urgent need to go to the bathroom, inability to control bowel movements; * an increased number of bowel movements; or * stomach pain, nausea, vomiting, diarrhea, rectal pain. Other side effects that may occur while taking Xenical include: * problems with your teeth or gums; * cold or flu symptoms; * headache, back pain; or * skin rash or itching. Side effects other than those listed here may also occur. Talk to your doctor about any side effect that seems unusual or that is especially bothersome.